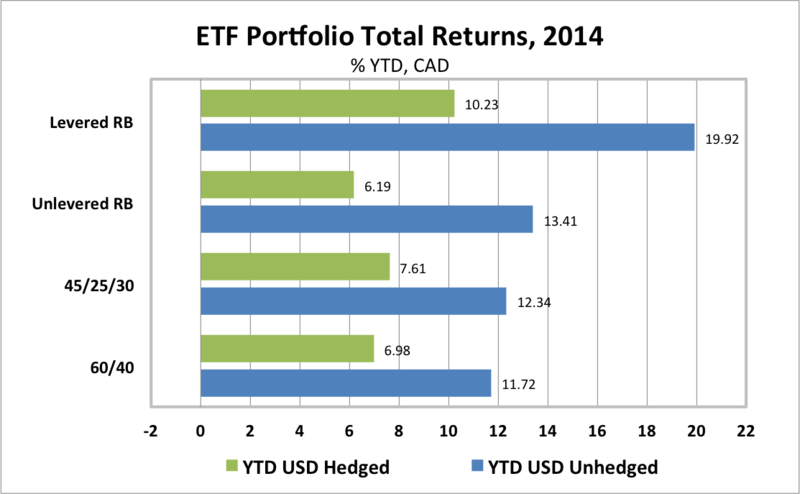 Global ETF portfolios performed well for Canadian investors in 2014. Much of the strong performance was attributable to an 8.4% depreciation of the Canadian dollar relative to the USD that provided a tailwind and proved quite profitable for Canadian investors in global ETFs. Global growth was a bit weaker than expected in 2014 and global inflation was significantly weaker than expected. Global growth divergences increased as US, UK, China, India, Canada, Australia and Korea grew at or above expectations, while Japan, Eurozone, Brazil, Russia and Mexico grew much slower than expected. Most Emerging Market economies grew well below trend with India and Korea being notable exceptions. Global inflation fell to its lowest in at least a decade, compared with forecasts at the beginning of 2014 of a meaningful rise in global inflation. The Eurozone, China, UK and Korea all posted much lower than expected inflation. Global central bank policies diverged, with the US Fed ending its QE program and preparing markets for an increase in the policy rate in 2015, while the BoJ, ECB, and PBoC eased policy. Russia and Brazil were forced to hike policy rates to support their currencies. The USD appreciated against virtually all global currencies. Led by crude oil, commodity prices plunged, particularly in the September to December period, putting significant pressure on the currencies of commodity exporting countries, including Canada. Bond yields fell virtually everywhere, with Russia being a notable exception. From my perspective, a key development for markets came at the end of August, when Fed Chair Janet Yellen delivered a speech at the Jackson Hole meeting of central bankers that presented a balanced view on the outlook for the economy and the need for normalization of US monetary policy. The market had been expecting Yellen to continue with the dovish talk that had been her trademark. In a September post, I referred to the market reaction to Yellen's speech as the beginning of "Exit Ennui" as the Fed prepared markets not only for an end of QE, but for a normalization of the policy rate in 2015. As I will show in this post, global ETF performance in the final four months of 2014, as Exit Ennui took hold, was far weaker than prior to Yellen's Jackson Hole speech. With other central banks showing little or no interest in normalizing monetary policy, the appreciation of the USD accelerated. With the major economies outside the US locked into subpar growth, the rising USD created an environment in which crude oil prices collapsed and most other commodity prices continued to weaken. For its part, the Bank of Canada continued to signal that it was in no hurry to raise its policy rate (see my November post). After all, Canada had begun to normalize its policy rate back in 2010, raising it to 1.00% from its low of 0.25%, and already had a tighter monetary policy than other major DM economies. In this environment the Canadian dollar (CAD) depreciation versus the USD accelerated following Yellen's speech. In 2014, with the USD appreciating 9.3% against the CAD, the best global ETF returns for Canadian investors were in USD denominated bond and equity ETFs. The worst returns were in commodities, Eurozone and Japanese equities and local currency Emerging Market bonds. The chart below shows 2014 returns, including reinvested dividends, for the ETFs tracked in this blog, in both USD terms and CAD terms. 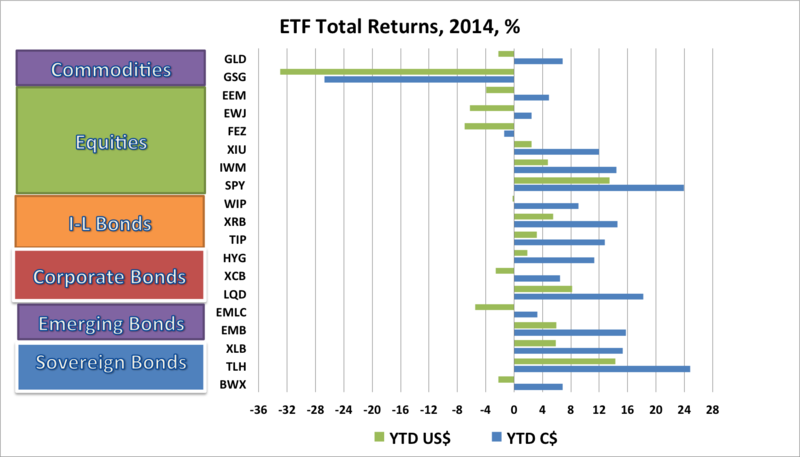 Global ETF returns varied dramatically across the different asset classes in 2014. In USD terms, 10 of the 19 ETFs we track posted positive returns, while 9 ETFs posted losses for the year. In CAD terms, 17 of 19 ETFs posted gains, while just 2 posted losses. The best gains were in the US long bond ETF (TLH) which returned a stunning 24.8% in CAD. The S&P500 ETF (SPY) was second best, returning 24.0% in CAD. Other gainers included US Investment Grade Bonds (LQD), which returned 18.2% in CAD; USD-denominated Emerging Market bonds (EMB) 15.8%; Canadian Long Bonds (XLB) 15.4%; Canadian real return bonds (XRB) 14.6%; US small cap stocks (IWM) 14.5%; US inflation-linked bonds (TIP) 12.8%; Canadian equities (XIU) 11.9%; and US high yield bonds (HYG) 11.3%. The worst performer, by far, was the commodity ETF (GSG), which returned -33.0% in USD and -26.8% in CAD. Eurozone equities (FEZ), returned -7.0% in USD and -1.4% in CAD. Seven other ETFs posted losses in USD terms, but showed gains in CAD terms, including non-US inflation-linked bonds (WIP) +9.1% CAD, non-US sovereign bonds (BWX) +6.9% CAD; the gold ETF (GLD) +6.9% CAD; Canadian corporate bonds (XCB) +6.5% CAD; Emerging Market equities (EEM) +5.0% CAD; Emerging Market Local Currency Bonds (EMLC) +3.3% CAD; and Japanese equities (EWJ), which gained 2.5% in CAD terms. 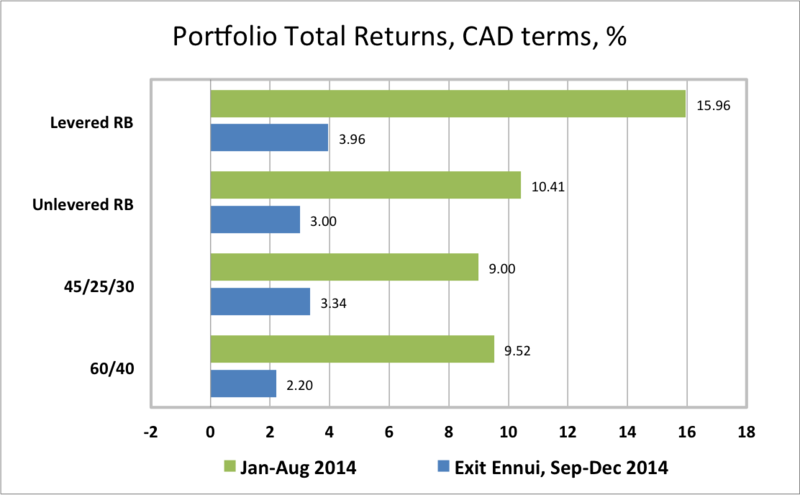 In 2014, the Canadian ETF portfolios tracked in this blog posted strong returns in CAD terms when USD currency exposure was left unhedged, but only moderate returns when USD exposure was hedged. In a November post we explained why we prefer to leave USD currency exposure unhedged in our ETF portfolios. The traditional Canadian 60% Equity/40% Bond ETF Portfolio gained 11.7% in CAD when USD exposure was left unhedged, but just 7.0% if the USD exposure was hedged. A less volatile portfolio for cautious investors, the 45/25/30, comprised of 45% global equities, 25% government and corporate bonds and 30% cash, gained 12.3% if unhedged, but 7.6% if USD hedged. 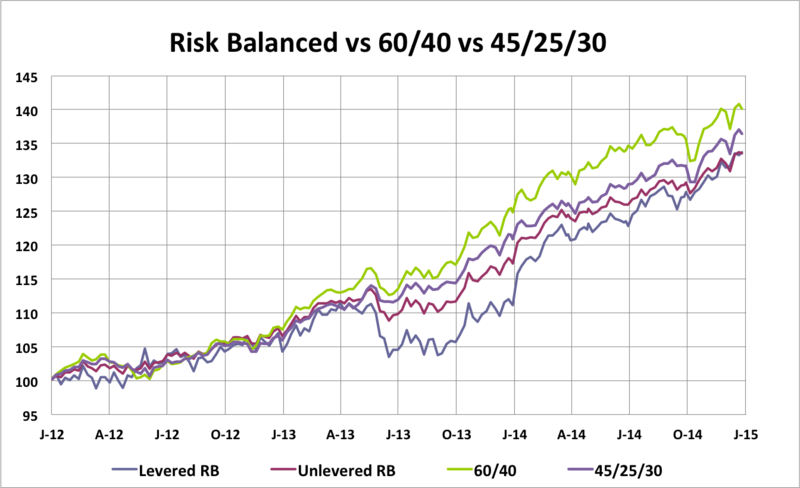 Risk balanced portfolios outperformed in 2014 after a relatively poor year in 2013. A Levered Global Risk Balanced (RB) Portfolio, which uses leverage to balance the expected risk contribution from the Global Market ETFs, gained a robust 19.9% in CAD terms if USD-unhedged, but had a less stellar gain of 10.2% if USD-hedged. An Unlevered Global Risk Balanced (RB) Portfolio, which has less exposure to government bonds, ILBs and commodities but more exposure to corporate credit, returned 13.4% if USD-unhedged, but just 6.2% if USD-hedged. As mentioned, asset markets lost significant momentum in the last four months of 2014 after Janet Yellen spoke at Jackson Hole. The chart below shows global ETF returns, in local currency terms, dividing the year into the first eight months and the final four months. In the January-August period, virtually all ETFs posted positive returns with the exception of modest losses in commodities (GSG) and Japanese equities (EWJ). 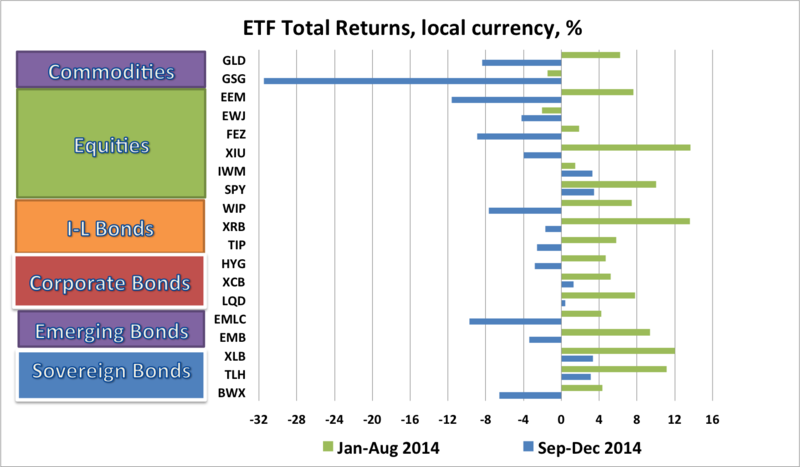 In the September-December period, 13 out of the 19 ETFs posted negative returns in their local currency. Bucking that negative trend were US equities and US and Canadian long bonds. Commodities, Gold, Emerging Market ETFs, non-US equities, Inflation-Linked Bonds and High Yield bonds all posted negative returns as Exit Ennui took hold. As a consequence, ETF portfolio returns, while still positive thanks to a 6.9% appreciation USD versus CAD, lost significant momentum over the September-December period. In USD terms, all of the portfolios posted losses in the final four months of 2014. This can also be seen in the tracking of weekly portfolio returns since the beginning of 2012. Two significant portfolio drawdowns have occurred over this period: the Taper Tantrum drawdown of 2013, when Fed Chair Bernanke indicated that the Fed would taper the QE program, and Exit Ennui drawdown, when Fed Chair Yellen indicated that the Fed would begin to normalize the policy rate. While the equity-heavy 60/40 portfolio performed best over the past three years, the more conservative 45/25/30 portfolio was the second best performer as it suffered less in the drawdowns and was generally less volatile. As we enter 2015 in a continuing uncertain environment, characterized by US economic strength, significant global divergences in growth and central bank policies, and collapsing oil and other commodity prices, remaining well diversified with an ample cash position continues to be a prudent strategy.